He who laughs first, does not always laugh last. After being arrested the other day for the murder of his third wife Kathleen Savio, Drew Peterson was off to court yesterday to face the murder charges before him. However, the judge delayed the arraignment until Monday, May 18, 2009 as Peterson’s attorneys were not present and out of town. Peterson is being held on a $2 million bail. While being escorted by Sheriff’s deputies into the Will County courthouse the 55 year old, former police sergeant chewed gum and made jokes as he entered the courthouse to face murder charges in the death of Kathleen Savio. 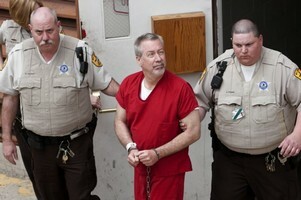 Dressed in a red jailhouse jump suit, Drew Peterson made such jokes as “Look at this bling. Look at this nice, spiffy outfit,” while referring to his shackles and jail issued attire is all jokes now. We shall see who is laughing in the end when the trial is over. Comments from Peterson attorney Joel Brodsky regarding his clients comments. Despite his flip comments, “Drew takes these charges very seriously,” defense lawyer Joel Brodsky said Friday in an interview on ABC’s Good Morning America. Brodsky said “wisecracks and comedy” are just Peterson’s way of dealing with stress. The only thing to make this better would be if Drew’s twin, Joel Brodsky, could be arrested!!! How this man has lived with himself all of these years is beyond comprehension….check out those always present bags under is eyes though—-looks Drew Peterson hasn’t had a good night’s sleep since LE finally caught on and persued the investigation & began to dig even deeper into his horrendous, murdering, psychiopathical, murdering life. Thank God that last niave/stupid/confused/young girlfriend finally got a clue and left him…she should be thanking her Father that he kept after her and got his story & pleas out to all who would hear. Would someone please knock the smirk off of this man’s ugly face??? It’s about time LE arrested the sorry POS!! May you rot in hell, Drew Peterson, for the murders of Katheen and Stacy!! Take note Joron things really do come around. Your day is coming. Well,Drew certainly won’t be the prettiest blushing bride to walk down the isle into prison. Just put a sack over his head ….and let the inmates do the smirking.